The rose 'Ketchup and mustard' is a new floribunda variety with a stunning flowering in thick rounded shrub groups, which gives continuous abundance of flowers, characterized with a long flowering period. The unique spectacular blossoms with very thorny stems, that stand out on the glossy green leaves, are a mix of super bright red outside and velvety golden yellow inside, really in color mustard, more obviously before the rose to open completely. 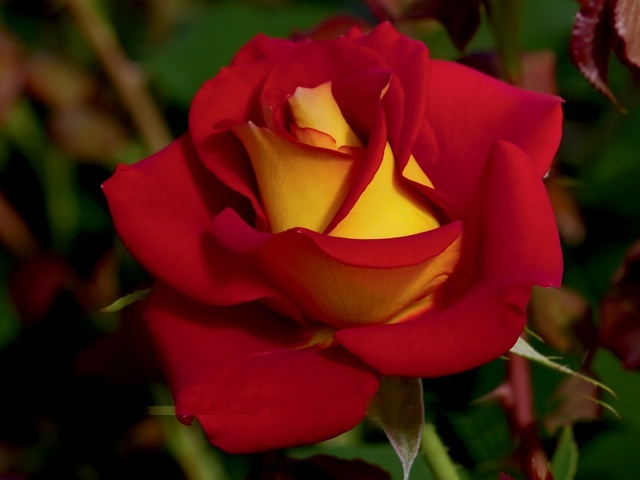 The rose 'Ketchup and Mustard' is an eye-catching, next generation of rose growing, with incredible contrast of color, which the people refer to as 'garish' color combos. The species requires little space (about 3-4 feet tall and 2-3 feet wide), which needs of minimal care, and has no known issues of diseases that hurt other varieties.